You must be a member of the Istanbul Latin Fever Group to attend this activity. Would you like to join this group? Let's tango! A great opportunity to learn the basic steps of one of the traditional dances of Argentina. 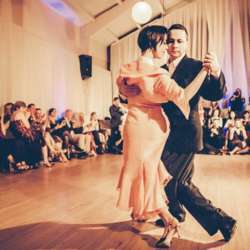 Dancing Tango is not only about you and you-and-your-partner. It is also a social event and being part of a culture. It involves more than the two who (it takes to) tango: it is about all those present at the milonga (tango dance party,) as well as all those who are intimately related to Tango, in the past, present and future, other dancers, the composers of the songs that you dance to, the musicians who recorded the songs, all the people who were passionate about Tango throughout the history of this dance where our very unique nature as humans manifest, and those who, in the future, will enjoy it after inheriting it from us. Please wear comfortable clothes that doesn't restrict your movement, and wear shoes with a smooth sole that you can slide or pivot in. No partner needed, we rotate partners in class. After the class we will go to a local bar for drinks.